Luxury Latin America is the #1 website for luxury travel in South America, Central America, and Mexico. Luxury Latin America is aimed at the very high end of the travel market, specifically to those wealthy travelers who are planning a trip to destinations in the Americas between Mexico and the Southern Cone of Argentina and Chile. This independent online magazine reviews only the very "best of the best" hotels and resorts in each country and travel tour features are focused on high-end, special trips that go beyond the routine. Vacation and retirement real estate features are geared to investors buying vacation or retirement homes in Latin America. - The average monthly household income of our readers averages $189,000 per year. - 82% have a college degree or advanced degree. - They average 2.8 international trips per year. - We reach a broad age demographic between 28 and 68. - Readers are 56% female, 44% male. On average, between 60 and 70 percent of our visitors are from the United States and Canada, the rest primarily from Latin America and Europe. The site officially launched with full destination coverage and its first advertisers in 2008 and has received a flurry of media attention as the prime luxury travel content site for the region, getting praised by Travel Weekly, USA Today, Delta Sky, Forbes Traveler, San Francisco Chronicle, Fox Business News, Business Traveler, International Living, Travel Professional, and Latin Trade. Luxury Latin America is the prime destination for researching a vacation or holiday in the Americas and benefits from both returning visitors and high search engine positioning. All our contributors are well-traveled professional writers with hundreds of years experience between them. Many of our writers live at least part of the year in the region they cover. A good number of them are guidebook authors and frequent contributors to major U.S. magazines. Total Unique Monthly Visitors - seasonally ranges from 19,000 to 30,000 per month, more than half a million page views per year. Average time on site: triple the industry average for content sites. Average page views: 3.2 per visitor. 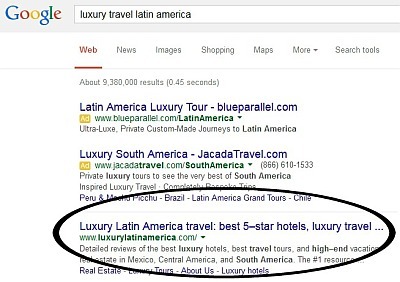 Google and Bing presence - on front page for more than 400 keyword phrases related to luxury travel, hotels, and tours in the region and specific countries of Latin America. We have more than 11,000 social media followers across various platforms, all gravitating to us organically and with a high followers/following ratio. Does your product or service appeal to wealthy travelers already interested in visiting Mexico, Central America, or South America? Or those wanting to buy vacation or retirement real estate in Latin America? Get in front on them through our very reasonable luxury travel ad packages. For ad inquiries, please contact donna [ at] luxurylatinamerica.com. or call 1-(813)-603-7203.